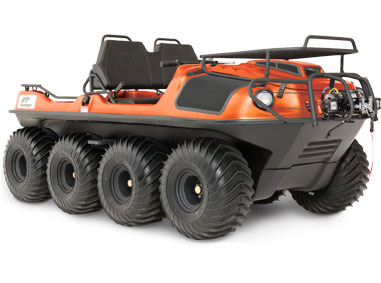 This XTV comes with Argo’s most popular accessories straight from the factory, including a front cargo rack, brushguard, aluminum beadlock rims and a 3,500 lb. Warn winch. It also comes with Argo’s new QT muffler which makes the 30 HP Kohler Aegis V-twin quieter than ever before. The ST LE can handle a payload of 1,070 lbs., tow up to 1,800 lbs. and seat up to 6 people, while the Admiral transmission is available with standard or high torque gearing. This XTV model is available in green or orange.